This weekend has been pretty good. Friday night my parents and I went to Champa, since my dad had never been there before. I had roasted duck, which was quite good. It was difficult for me not to order Pad Thai for a fourth time. Yesterday, my mom planted over fifty plants in my yard. The area to the right of my front door is really starting to look nice and should be gorgeous in the spring. The weather was fantastic, so I enjoyed admiring her technique and delivering refreshments. My dad planted several, too, and drilled a couple of outdoor lights into some of the oaks along the driveway, to use as temporary lighting when people park further away for parties. Today I spent most of the day washing dishes and cooking. I made a two layer mocha cake this afternoon. After that I made a shrimp, bacon and pesto pizza. I used my mom's recipes for the cake and the pizza crust. Both turned out rather well, I think. ..although like many of the things I've baked, the cake could have been in the oven a little longer. I'm wondering if there's something calibrated wrong on my oven or something. I wanted to practice making these recipes before I invite non-family members to eat them next weekend. I'd never made a cake before...or pizza. My mom's mocha cake is definitely my favorite. 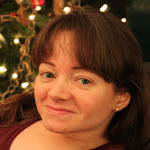 I must have a really good excuse for not blogging in so long, especially right after getting my wireless router working. First, I spent most of last week agonizing over preparations for my party on Sunday as well as whether it would be complete sogged out by Hurricane Ivan. The night following the party, I was completely exhausted. Since then, I've been washing dishes and cleaning up. I think the party was a success. I certainly had a good time, which, of course, is the most important thing. I made chocolate chip cookies, coconut macaroons, lemon parmesan garlic dip from the Cook Something cookbook that RP gave me, modified some guacamole and thawed some samosas. I also served mixed fruit and veggies, four different cheeses, crackers and french bread. You're probably guessing that I had a lot of food left over and you would be right. The best part of the party was seeing people I hadn't seen in ages, like PA, LG, and SC. It was wild having sixteen people in the house at once. I couldn't personally introduce everyone or show off the house, because there was more to do in the kitchen. Fortunately, CL was happy to give tours. Also, the good thing was that I was never worried about anything getting damaged. Lectures about coaster use weren't even necessary, but then again, my invitation kind of implied that I was overly concerned about that kind of thing. Part of it did have to do with Ivan. We've had so much rain this summer with rain from so many hurricanes. Then it was predicted that we would get heavy rains all weekend from Ivan. I decided to move my party from Saturday to Sunday, with the hopes that it might be somewhat better. I was worried most about people's cars getting stuck in the grass parking area. Fortunately, Ivan came back south Saturday afternoon as a mere low pressure area, drying everything out and Sunday was an absolutely gorgeous day. People even got to sit out on the deck. Now I can plan for my next party, in October. I didn't want to invite everyone at once, because I thought that would be a little overwhelming and I also wanted another one for people who couldn't make it to the first one. After work today, I went to the Around the World Market with PS. I was running out of frozen Indian food dinners and they were having a 99 cent sale, so I got a bunch more. I also got some food from the cafe to take home for dinner. I'm also happy knowing that I have fifty more samosas in the freezer. I was arguing with a co-worker about cicadas and I found the CicadaMania site. I was actually blogging from my deck earlier and several birds and a squirrel started eating birdseed that I had on the deck rail while I was sitting there. 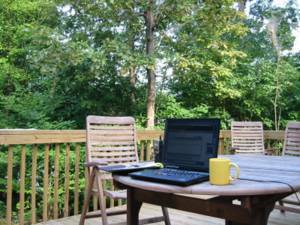 I'm blogging from my deck! That's right, I'm finally using wireless. I invited JJ and JA over to have brunch this morning and they took a look at my wireless router and DSL modem. In just a few minutes, I was up and running. The problem was that Sprint was giving me the IP address of 192.168.1.1, which was the same IP address that the router wanted to use for the local network. Due to this overlap, the wireless router wasn't talking to the DSL modem at all. So, in the Linksys router configuration, JA set the Local IP address (router's address) to 192.168.1.129 and the Subnet Mask to 255.255.255.128. Finally, he set the DHCP addresses to start at 192.168.1.130. Effectively, this meant that the lower half of the subnet mask could be use for the external address and the upper half could be for the local addresses. At least, I think that's the best way to explain it. The other cool thing about their visit was that we ate outside using my deck furniture for the first time. It really is pleasant sitting out there (here). I baked some biscuits, microwaved some bacon, washed some raspberries and I watched JJ fry some eggs. I'd made scrambled eggs before, but I'd never made over easy or sunny side up. Overall, I thought it was an excellent meal and I had a great time. I''ve made biscuits twice in the last two days and I'm really happy with them, because they're just so easy. I don't thinking anything else noteworthy has happened in the past week. All I can remember is that on Friday night, I went to Casa Ibarra and ate Vegetarian Meal #10. Today My main accomplishment was making rolls. This was my first experience with using yeast as well as my first use of my new Kitchen Aid mixer. I had a hard time getting the dough to rise. Basically, I keep my house too cold, I think. Once it sat in my warmish oven for a bit, the dough rose nicely. The rolls turned out great and there are only two left. It's wild, though, because I used the recipe that my mom has used forever and they turned out quite differently. Apparently, I should have added more flour, because my dough was rather sticky. Once baked, there the holes inside were a lot larger than hers. While I was very happy to eat mine, I like my mom's better, so I'll have to keep working at it. Also, all the rolls ended up mushing into each other, so I had to pull them apart. That was mostly cosmetic, though. My parents planted several more plants today. It's really starting to look cool. I was just unpacking a box full of letters that I mostly received about ten or eleven years ago. It made me realize a couple of things. If you have any doubts about the person's ability to stay in touch with you, then you should sign your full name. Otherwise, after a few years, it's really hard to look someone up if you have a bad memory. Of course, some might say that if you can't remember their name, then maybe it's not worth communicating but it might be. The other thing I realized was that I'm really bad at responding to e-mail. Yes, these were real genuine letters, but I also have e-mail that some of the same people sent two to five years ago, too. Hopefully their addresses still work. In my last post, I neglected to mention what I actually did yesterday. After work, I went to a picnic at the Duke Computer Science department, honoring the former department chairman. It was catered by Bullock's, so they had good barbecue, hush puppies and brunswick stew. Dessert was probably catered by somewhere else, but they had a cake with white icing and bright red cake innards. The flavor of the red dough was almost completely tasteless, but they also had brownies that were wonderful. More importantly, I talked to several people from the department that I hadn't seen in a while, so that was fun. Today, my mom came over and planted forty small plants. That puts a significant dent in all the pots in the yard. I think it's going to look very nice. Our neighbor came over and chatted a while afterwards, so that was fun. My parents and I went to ACME Food & Beverage Co. for dinner. I had pecan crusted catfish with lump crabmeat, tomato and country ham, served over french fries. It was supposed to have grits instead of fries, but I asked for the switch. I would again like to blame my infrequent posts to my inability to get my wireless router working. Of course, this is largely due to infrequent attempts to nudge it into cooperation. I still need to coerce someone into glaring at it more fiercely than I am able to do. Now that the Olympics are over, I can at least spend more time in the guest room without feeling as if I am missing something. It is crucial that the router's recalcitrance be rectified by the start of the fall television season. I had a very active week. Last Saturday, I went to a WH's bridal shower. I had a very good time. The food, of course, was excellent. We played a lot of amusing games. I had never been to a bridal shower, so I really didn't know what to expect. Rest assured that we did not have a stripper, but there was a lot of discussion about not having one. On Sunday, I went to JJ and JA's house warming party. That was a lot of fun. The food was simply amazing. We had pumpkin soup, shrimp etouffe, chicken sate, deviled eggs, creme brulee, tiramisu and tres leches cake. I was simply in heaven from the food and got to spend time talking to friends for hours. Add two beagles for entertainment and it's an evening that's hard to beat. On Wednesday, I had to leave work early (for me, not for most people) to pick up REC, Line and Sinker from the airport. They are all yellow bellied sliders, i.e. turtles. 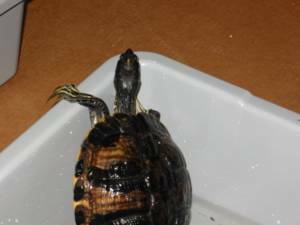 About four years ago, when they lived in Durham, E&ES raised a bunch of baby turtles from eggs that were laid near ES's apartment building. They kept four of them, but now they've gotten too big for their 150 gallon aquarium. On my parents' property, there is a 1/3 acre pond, so E&E thought it would be best to release three of them. So, Wednesday morning, they shipped them from Portland, Oregon to Raleigh-Durham. Unfortunately, they were two hours late in taking off from Portland, so they missed their connecting flight in Cincinnati. My dad and I went back to the airport again around 9pm and successfully picked up. Once we got back to my garage, we put them in Rubbermaid bussing tubs with about two inches of water. Line, the largest turtle, tried to climb out and a couple of times ended up on his back. This was a serious problem, because their being on their backs compresses their lungs, making it harder to breathe. We put Line in a taller tub, but he was still climbing. I called up E&E and they said to add more water. That way, they couldn't get traction on the tub floor and couldn't raise themselves up. Problem solved. The next morning, before I went in tot work, we released them in the pond. They were very eager to get out, the closer their buckets got to the pond. Off they went into the light green abyss. Later that afternoon, at two different times, my mom saw two different turtles on a little island in the pond. It could have been them or some of the many other yellow bellied sliders that live in the pond. We'll never really know, but we can probably be sure that they'll be happy swimming around in a great big pond. 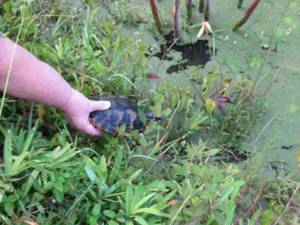 My mom's arm, putting one of the turtles at the edge of the pond.